Last year, it was my turn to host Thanksgiving dinner. My daughter brought her boyfriend; my mom flew in from Michigan; my brother and his wife drove up from Washington, DC; and my nephew and his family came down from New York. I served a Thanksgiving meal that was well received but not traditional. It was strictly vegetarian, so there was no turkey or any other type of meat—or eggs or dairy, for that matter. Most of the food was low in fat, cholesterol free, high in fiber, vitamins, and minerals—and big on taste. Everyone loved the herb biscuits, white bean chili, baked sweet potatoes, and salad and didn’t utter a word of discontent. What we perceive as a traditional Thanksgiving meal may or may not be so traditional, depending on how far back in history you go. According to the Plimouth Plantation historical website, the Pilgrims and Wampanoag people didn’t serve some of the so-called traditional Thanksgiving dishes. They might have served goose, duck, swan, or most likely venison. White potatoes didn’t come north from South America until long after the first Thanksgiving celebration in 1621. Sweet potatoes were available if you lived in the Caribbean but not in New England. And pumpkins might have been part of the meal but only as a vegetable. Sugar was expensive, and most likely the colonists didn’t have butter or flour to make a piecrust. Apples weren’t native to North America so there was no apple pie, either. What’s considered a traditional Thanksgiving depends on your cultural background and where you were raised. I grew up in the 1960s and 1970s in a Midwest suburban household, so I consider canned cranberries, biscuits from a tube, and marshmallow salad (what my family called ambrosia) to be traditional. My Southern friends can’t imagine Thanksgiving without collard greens and macaroni and cheese. Americans in the Southwest may serve cornbread like my Southern friends, but they may add chiles and some bean dishes to the meal. Those who live along the coastlines may add oysters to their stuffing. Many traditional Thanksgiving meals often face two challenges: the amount of calories available for consumption and guests who may have food allergies, intolerances, or preferences, such as adhering to a vegetarian or vegan diet. But clients can handle these issues with some planning and ingenuity. To cut calories, they can serve healthful appetizers before the big meal, such as a tray of colorful veggies that includes red peppers, orange carrots, green broccoli, and white cauliflower and perhaps some less common options like white crunchy jicama, yellow baby corn, green asparagus spears, and brown marinated mushrooms. Using fat-free refried beans or a white bean pâté as a dip instead of a sour cream-based option reduces the calorie count, too. Clients also can serve plenty of vegetables or fruits with the main meal but should avoid options that call for calorie-heavy ingredients. For instance, they can serve green beans with almonds instead of the classic green bean casserole made with canned soup and fried onions; and sweet potatoes with cinnamon and sugar as a topping instead of white potatoes with sour cream and butter. And instead of canned cranberry sauce, they can make fresh cranberries with a little dash of sugar and maple syrup to cut their tartness and mix them with other fruit such as apples or oranges. Mixing puréed sweet potatoes, squash, or carrots into biscuit dough increases the veggies served with the meal while creating a beautiful bronze colored, slightly sweet roll. Salads should be included, too, to offer guests additional healthful and low-calorie options. Clients can add pears, strawberries, or apples to mixed greens, carrots, cucumbers, and green peppers and provide a tasty vinaigrette dressing. As far as beverages, clients can serve herbal tea, diet soda, or seltzer water instead of sugar-sweetened soda, apple cider, or fruit juice. For dessert, clients can make a fruit crisp using apples, pears, or blueberries, which includes high-fiber oats, instead of a traditional pie. Adding walnuts will boost the crisp’s nutrient content thanks to the omega-3s. Some of the options for cutting calories also accommodate those who have food restrictions or preferences. For instance, serving the vegetable tray with a bean dip can eliminate the dairy and offer a gluten-free choice. To further address food restrictions, clients can make two versions of the same dish, such as one bowl of mashed potatoes with butter and milk and another without. Last year I made two batches of biscuits: one with cheese and herbs and one without. Also, certain condiments such as cheese, bacon bits, and croutons can be served on the side, allowing guests to choose or omit these items from their plates. Another idea is to serve substitutions. 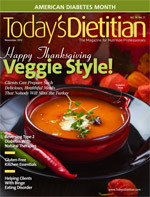 For instance, clients can prepare a tofu turkey with gravy made without meat broth or tofu pumpkin pie. But serving a fake turkey makes the absence of the real thing that much more obvious, so clients should consider whether such a move ultimately will detract from the meal. Another choice is to stuff a squash instead of a turkey, filling it with veggies, whole grains, and a few nuts. Whole grain breads and rolls tend to be vegetarian or vegan—and more healthful than the white versions. Clients can make vegan cornbread by substituting 1 tsp of ground flaxseed mixed with 2 tsp of water for the egg, and make gluten-free cornbread by using 100% corn meal and omitting the wheat flour. For dessert, vegan margarine can be used for a fruit piecrust, as can a gluten-free premade crust. Research by Brian Wansink, PhD, author of the book Mindless Eating: Why We Eat More Than We Think, shows that the size of the dishware you use greatly affects how much you eat. Serving food on smaller plates, drinks out of tall thin glasses, and desserts out of coffee cups instead of large bowls can greatly reduce the portions guests consume. However, no matter what clients serve, they should schedule physical activity such as taking a walk around the neighborhood to help burn off extra calories. They can encourage guests to play football instead of watching it on television. At the very least, they can sweep the floor and do the dishes. Always remember the purpose of the Thanksgiving holiday, which is to pause and be grateful for all we have. To help clients prepare a vegetarian meal, tell them about the recipes on pages 24 to 26 from the cookbook Vegan Holiday Kitchen by Nava Atlas. All recipes except the pear, apple, and cranberry crumble are gluten free, dairy free, egg free, and vegan. — Carol Meerschaert, MBA, RD, is a marketing professional and writer in Paoli, Pennsylvania. 1. Heat agave nectar in small skillet, sprinkle with cinnamon and salt. When agave nectar becomes bubbly stir in pecans. Cook over low heat, stirring frequently, until pecans are nicely glazed, 3 to 5 minutes. 2. In a serving bowl, combine the remaining ingredients and toss together. Just before serving, add pecans and toss again. 1. Heat the oil in a large skillet. Add the onion and sauté until translucent. Add garlic and bell pepper, and continue to sauté until onion is golden brown. 2. Add corn kernels, pinto beans, tomatoes, and seasonings. Stir well and simmer 10 to 15 minutes. Season to taste with salt. Remove from the heat. 3. Bring five cups of water to a rolling boil in a heavy saucepan or double boiler. Slowly pour cornmeal into water, in a thin, steady stream, whisking continuously to avoid lumping. Add salt and cook over very low heat, covered for 20 minutes, stirring occasionally. 4. Preheat oven to 375˚F. 5. Oil a shallow 1 1/2 quart baking dish and line the bottom with half of the cooked cornmeal. Pour the skillet mixture in and gently pat it in evenly. Sprinkle with the cheese. Top with remaining cornmeal, patting it in smoothly. 6. Bake for 45 to 50 minutes, or until the cornmeal is golden brown and crusty. Let stand for 10 minutes, then cut into squares to serve. 1. Preheat oven to 375˚F. Partially prebake the squash uncut for 30 minutes. Let squash cool. When cool enough to handle, scoop out seeds and discard. Peel squash and cut into half circles. Arrange in parchment-lined roasting pan. 2. Combine soy sauce, syrup, and oil in a small bowl and stir. Drizzle over the squash, then stir in cinnamon, nutmeg, and rosemary leaves. 3. Preheat oven to 425˚F, and roast for 20 to 30 minutes, stirring every 10 minutes, or until nicely glazed and tender. 1. Cook or microwave the whole beets until just tender. When cool enough to handle, peel and dice them. 2. Combine beets with the other ingredients in a serving bowl and toss well. Serve at once. 1. Spread chopped cucumber over 2 to 3 layers of paper towels. Cover with another two layers, then place a cutting board or some other weight on top. Let stand. 2. Place the spinach in the food processor and process until smoothly puréed. Add the remaining ingredients (except cucumber) and process until the spinach is well incorporated with the tofu, but not completely puréed. 3. Transfer to a serving bowl and stir in the cucumber. Serve at once or cover and refrigerate until needed. 1. Preheat oven to 350˚F. Combine the fruit mixture ingredients in a bowl. Spray a 9-inch X 13-inch pan with cooking spray, and pour fruit mixture into the pan. 2. Combine topping ingredients. Sprinkle over the fruit mixture. Bake for 40 minutes or until the fruit is soft. Purée mango pulp, tofu, and sugar until smooth. Top with fresh raspberries and mint leaves.